I love my natural hair and the versatility that comes with it — one day curly, the next day straight. But going from curly to straight can be a hassle and wash day can leave you anxious as you wait to see if your curls will revert. Contrary to popular belief, heat is not the worst thing for your hair—the improper use of heat is. So if you want to try a new look, but are a little afraid of heat damage, here are some techniques to minimize the heat and protect your strands. We all know that blow-drying can cause a lot of damage, not only because of the heat, but because of the manipulation. In order to straighten the hair, it needs to be kept taut. The tighter the curl the more tautly it needs to be pulled. In order to do this, many women use some type of brush that causes constant tugging and pulling on the hair creating split ends and breakage. Tension blow-drying is a more gentle way to blow-dry the hair that involves simply holding hair taut while you blow-dry. The hair will dry in the stretched state without the need for damaging tools. Many people mistakenly believe that the only way to get a straighter look is to pull out the good old heat tools, but there is a better alternative, roller setting. If done correctly you can be left with soft shiny bouncy curls that can be worn as is or wrapped to make the hair completely straight. The mere mention of the flat iron has the ability to bring fear into the hearts of many naturals who have heard the many stories of limp, lifeless, heat damaged hair. But like I said earlier, it’s all in the technique. When flat ironing, consider using a heatless method of stretching your hair prior to flat ironing, like roller setting, banding or braiding your hair. Also, turn down the heat! There is a nasty rumor going around that tight coils and curls require a lot of heat to straighten. The truth is, if you use thinner sections and implement the brush chase method (using a soft boar bristle brush to smooth out the sectioned hair prior to flat ironing) then the heat can be evenly distributed to each strand, and the hair will straighten with less heat. Also, remember that the more passes of the flat iron over your hair, the greater the chance for damage, so go over a section slowly (twice if you need to), then keep it moving. Don't go over a section repeatedly and most definitely do not ‘touch up’ your hair in between flat ironing sessions when it begins to revert. 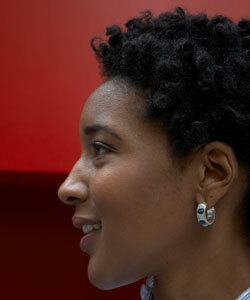 Instead, rock styles like twist and braid outs instead until it's time to wash again. I cannot stress enough the importance of a good heat protectant when blow-drying and flat ironing. Many of us have experienced the pain and discomfort of sunburn from a day spent out in the sun without sunscreen, so imagine what direct heat can do to your hair. A good heat protectant contains some kind of ingredient that will create a barrier between your hair and the heat of the flat iron thus preventing damage. However, keep in mind that there is no such thing as 100% protection. Be careful if you choose to use any oils as for heat protection as they can literally fry the hair. Do you safely heat style your hair? What are your methods?